With a recording career starting in 1963, Steve Kuhn has played with so many of the jazz greats that it is overwhelming to list them. He has long had a reputation as an exciting avant-garde pianist. This is a recording from 1968, originally released on MPS and, in the US on Prestige as ‘In Europe: 1968’. Here Kuhn is accompanied by Sweden’s Danielsson on bass, prior to his tenure with Keith Jarrett’s European Quartet which also featured Norway’s Christensen on drums. Comparing the piano styles of Kuhn and Jarrett is an interesting exercise, and one imagines that there was quite a switch for the rhythm section when they moved between the two. 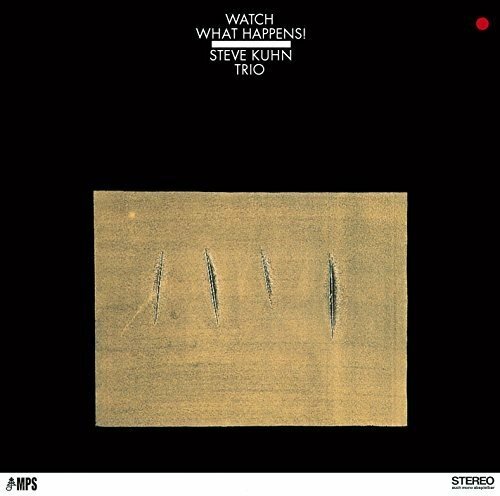 This recording of Steve Kuhn’s piano trio features a set including pieces by Michel Legrand (track 1, Watch What Happens, which provides the title for the session), Gary McFarland (track 3, Lament / Once we loved), John Addison (track 4, Tom Jones), Burt Baharach (track 5, Windows of the world / Here I am), Jule Stine (track 6, I fall in love too easily), Carla Bley (track 7, Ad infinitum), together with Kuhn’s own ‘Silver’ (track 2). Given the track listing, you might expect the trio to meander through some familiar territory with pieces that many of the listeners will know quite well. However, Kuhn is not comfortable with a simple statement of the piece in its original form. Throughout the set, Kuhn switches effortlessly from a melodic presentation of the theme of each piece and a bustling, free improvisation. Danielsson and Christensen propel each piece effortlessly with driving rhythms and delicate supporting playing on the slower sections. Rumour has it that the recording was made in a single take. Whether this is true or not, the spontaneity in the playing, the interplay of the musicians and the way the music sweeps and swerves has all the hallmarks of a live recording. This is masterclass is trio playing and, given how long the recording has been off the shelves, is a very welcome reissue on the MPS label.